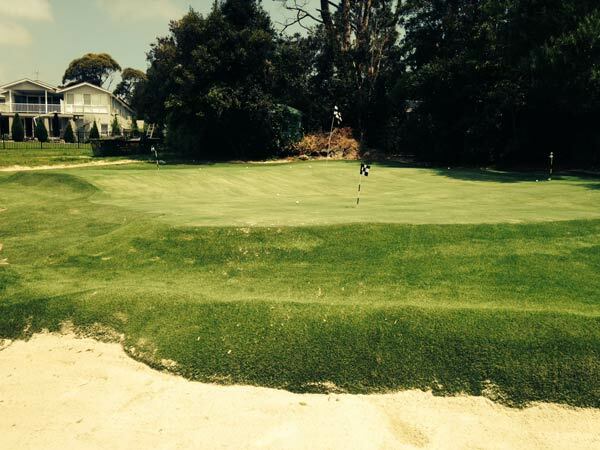 This is Australia's most realistic golf green. Ideal for the serious golfer or someone looking for something first class. This green reacts and behaves like a normal golf green but without the headache of maintenance. Improve your golf game, impress your friends and build your own golf paradise at your own home. You're only limited by your imagination. Build a replica of your favourite green, develop your own practice area or create your own golfing paradise. 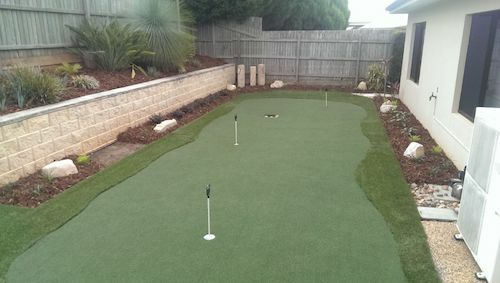 We can design your dream golf green for your backyard in any state in Australia. We'll work with you closely to come up with the very best design and concept for your property. Our Platinum product includes the best grass on the planet, unique underlay system (for amazing ball stopping capabilities), ultimate infill and care and attention like no other. 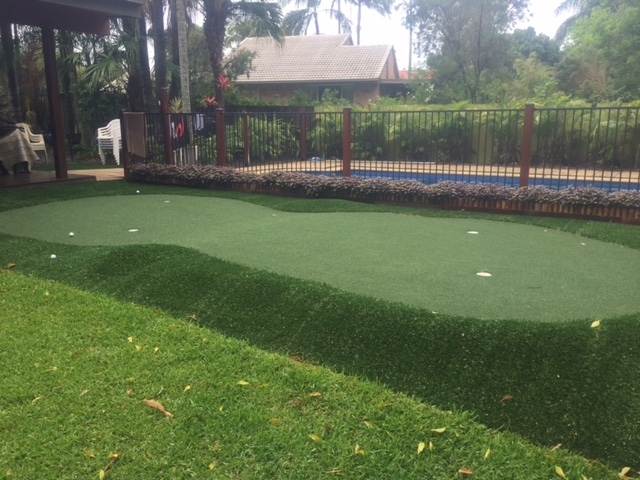 These golf greens are suited for the typical backyard in Australia. These greens use a slightly different grass from our Large Golf Greens (see above), but make no mistake, this is an amazing putting surface. You can pitch and chip from 15 metres and the ball rolls true from the get go. You still receive specialised care and attention from my trained installers, as we pride ourselves on making sure you get something truly special. We travel all over Australia for installs (we have trained golf green builders in most major cities). Please visit this page to get the ball rolling and get a firm price on what your golf green will cost. Whether you're looking for a small putt putt course for home or something more substantial (like for a commercial setup) then we have you covered. 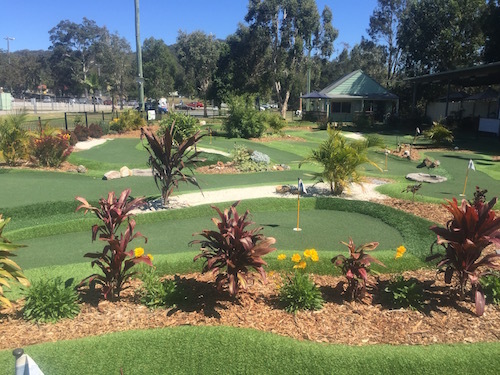 We have built a range of putt putt courses around Australia and have plenty of concepts that can make your course a winner. We also feel we've pioneered a unique form of putt putt. We've removed windmills and other strange objects and offer a more traditional golf experience. In our thinking, this attracts all golfers, both those new to the game, and those who are more traditional. And perhaps best of all, our putt putt is way more cost effective than our competitors. If you are on a budget and you're the handy type and don't mind getting your hands a little dirty then the DIY option is for you. We now stock and supply a specific DIY synthetic grass. This grass has been created to be easier to install and it's perfect for small backyard putting greens. 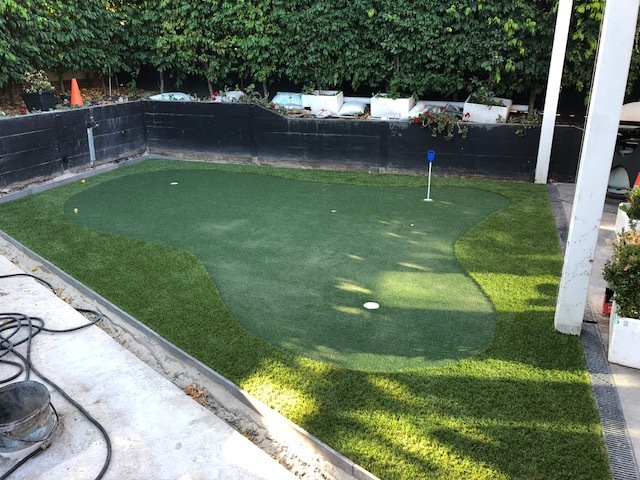 We have created this product because the cost of a fully installed synthetic golf green can be prohibitively expensive ($15K-$20K + typically for an Executive Green). Our DIY grass allows you to work to a tighter budget and is also much easier to install. Please click here and fill in the short survey. Q.How much do these greens cost? A.Pricing comes down to your exact shape and design and your location. It’s almost impossible to give an accurate ballpark price before understanding all of your needs. In most cases, a fully installed golf green is going to start at $4k – $5k and go up from there. Q.What sort of grass do you use? A.We only use the very best grasses available. We don’t use cheap imports (never have and never will) and we’re super-serious about offering premium products. We don’t cut corners and work hard to deliver. All grasses have been tested by us and we only use the products that we would be happy to use ourselves. Q.Previous synthetic greens I've seen were terrible, what makes yours any different? A.I hear you loud and clear. The very first synthetic golf greens were hopeless. They were way too hard and fast and not realistic enough. Our new-generation grass has changed the game. Not only do our grasses (mixed with our install techniques) look fantastic, you can also hit lofted and spinning approaches to these greens. The grass absorbs the impact of the shot (without leaving pitch marks) and the ball will spin to a stop. Many of our competitors grasses come from hockey and lawn bowls. Our grasses have been created exclusively for the demands of a small and hard ball. And we don’t mess around here. We are passionate golfers who believe in this product. While we’re competing with those who use cheap grasses, we differentiate ourselves by providing great information and backup service. Q.Can I get a quote? Not sure? No worries, click here. 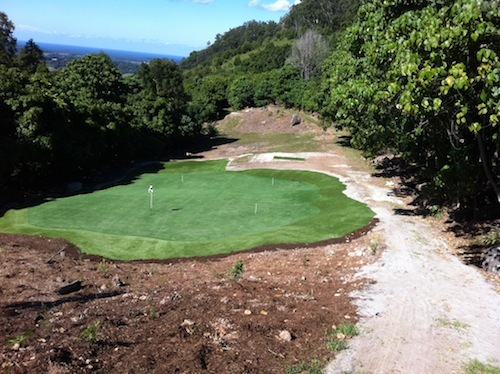 A.We have installed synthetic golf greens in every state in Australia. We’ll travel anywhere and now have installers in most major cities. This means our pricing is even more competitive than ever! Q.I only have a small backyard, can you still install for me? A.This depends on your budget. Our starting price is typically around $4K. Sometimes, on these really small greens, you don’t get any economy of scale and the price seems high. If your green is really small, your best option is to go with the DIY option. But, if you’d like to get a price for a fully installed golf green, please click here. Q.Can I purchase the grass from you and get someone local to install? A.Yes, this is an option. In fact, we work closely with many landscape guys and help them install your green to the highest standard. We can also pass on our DIY guide to help them through. As of April 2019 we have trained installers in most cities and these guys are the best of the best. They are also price competitive and understand golf. So click here to arrange someone to visit your property for quotation. Q.I'm really keen, can you come give me some ideas please? A.Yes, we have installers in most cities and we/they can help with your design. Best you start here and we can start helping you come up with a great design. Q.Can I see some price ideas? A.Please see our pricing page here. Q.I'm not sure, what should I do? A.No worries, please go here and let’s have a chat. We’ll find a time that works for both and go over all options with you.